If your vehicle is in an accident you owe it to yourself to have it restored back to its original condition. At Universal Auto Body we are driven to a higher standard and it shows through our work every day. We focus on getting you back into your vehicle in a timely manner, without comprimising quality and strive for 100% customer satisfaction. Our goal is to exceed your expectation and our company proudly embraces every oppurtunity to do so. You're in Great Hands! Let us take care of everything. We can transport your vehicle, arrange the rental car and work with your insurance company to return your car to pre-accident condition. All you need to do is drop off your keys and we'll handle the rest from there. It's that easy. It's important to make the right choice when deciding on where to have your vehicle repaired. At Universal Auto Body, we make the decision easy with a lifetime warranty. All of our body work and paint refinishing will be free of defects for as long as you own your vehicle. We are a state of the art facility that provides professional and affordable repairs to everyone. 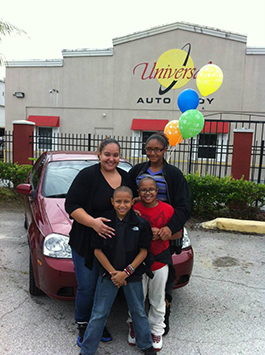 Universal Auto Body is a family owned and operated business that believes in giving back to the community. We are commited to keeping our air, water, and land clean by supporting all environmental protection acts, including the St. Johns Water Management Act, the Environmental Protection Agency, and OSHA. Please contribute to our success by considering us as your auto collision and refurbishing needs. Please take a moment of your time to fill out a brief survey. Your input is important to us! Please Click Here to Write a Review. Congratulations to Jennifer and her family! See more pics on our Facebook page here!